EIM provides every student with a 365 account to assist in completing their studies. The following is a brief overview of how to use 365 on campus and at home. Turn the computer on. If the computer is already turned on ensure no other student is currently using it and if a user is already logged on, log them out. On the logon screen select “Other User” and enter your provided EIM 365 username. If you have not been provided an EIM 365 username ask your trainer or administration for assistance. 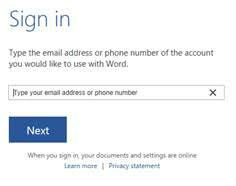 Your EIM 365 account password will be “Password01”. Once you have reached the desktop you will be able to access web browsers (Google Chrome or Microsoft Edge) and Microsoft Office 2013 (Word, Excel, Power Point, OneNote, Access, Outlook and Publisher). 1. Open a Microsoft Office 2013 app (Word, Excel, PowerPoint, OneNote, Outlook, Access or Publisher). 4. Enter your password which will be "Password01" and ensure "Keep me signed in" is ticked. 1. Click the OneDrive shortcut on the desktop. 7. After a few moments you will be asked “Did you mean to switch apps?” click yes. 8. Wait for your OneDrive to be set up. From here you can access online versions of Word, Excel, PowerPoint and OneNote. Once Microsoft Office 2013 has finished installing refer to ‘Using Microsoft Office 2013 on Campus’ and ‘Using OneDrive on Campus’ to setup the apps on your home computer. Clicking “New” will allow you to create a new Word document, Excel document, PowerPoint document or OneNote notebook using the online versions of the Microsoft Office 2013 package. You can also create a new folder. Clicking “Upload” will allow you to upload a document to your OneDrive so it can be accessed from anywhere.